It’s the holy grail of justifying corporate communications to the Board – establishing the link between reputation and financial performance. But what evidence exists to demonstrate this link? How does this change according to industry sector? And what should we as corporate communicators be most focused on to lead the debate on this issue? These questions and more were at the centre of the Repute Associates & Caliber Breakfast Seminar held on Wednesday, 3rd October. Corporate Affairs Directors and Heads of Corporate Communications heard from a panel of experts, including Shahar Silbershatz, CEO of Caliber, Brittany Golob, Editor of Communicate magazine, and Jim Connor, Director of Communications at Lloyds Banking Group. There is a strong body of evidence that establishes a clear relationship between corporate reputation and the financial valuation of a company. But when it comes to showing a link between specific financial indicators such as revenues or profitability, a more accurate way of demonstrating the relationship is by looking at the financial impact of a change in reputation. All companies have a natural reputation, based on sector and individual circumstances. But if that reputation changes significantly, changes in financial performance can be measured. The role of sector reputation creates paradoxes in measuring the relationship with financial performance. 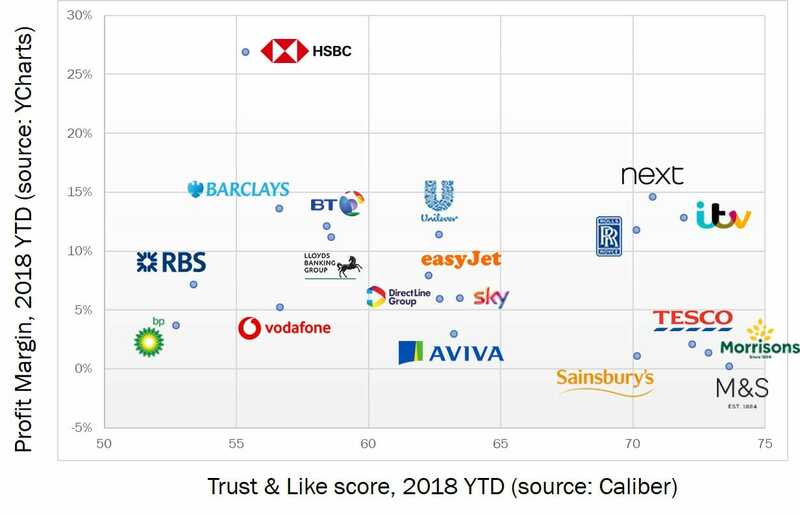 Recent research from Caliber shows some of the companies with the strongest reputations in the UK, such as M&S and Morrisons have some of the lowest YTD profitability. Conversely, companies with less positive reputations, (eg, HSBC), have delivered high profitability. The question for companies is how to distinguish themselves from how the sector in which they operate is perceived reputationally. Differentiation can be achieved through developing a clear sense of corporate character. Companies should be asking themselves who they are, what they want to be, and expressing their characters through appropriate behaviours and actions. Good character will attract good talent to maintain the business competencies needed in a changing world. Fear of the financial losses incurred as a result of a crisis still remains a big driver for CEOs to care about brand and reputation. Reputation risk management is central to companies in scrutinised sectors such as Financial Services or Oil & Gas. However, most enlightened CEOs understand the need to push forward and defend reputation at the same time. Tesco’s response to the horsemeat scandal of 2013 is a great example of reshaping a positive reputation from a loss of public trust. continuous measurement stream that can serve as a clear evidence base for Boardlevel discussions. The dialogue between corporate communicators and a financiallyfocused Board is not a ‘natural marriage’. Clear data acts as a bridge over this divide. The dialogue has moved on from convincing senior management about the importance of reputation to convincing them that Corporate Affairs is a credible partner to maximise the power of reputation over time, through data, strategic plans and focused outcomes. There is still value in telling truth to power and helping our organisations become better.